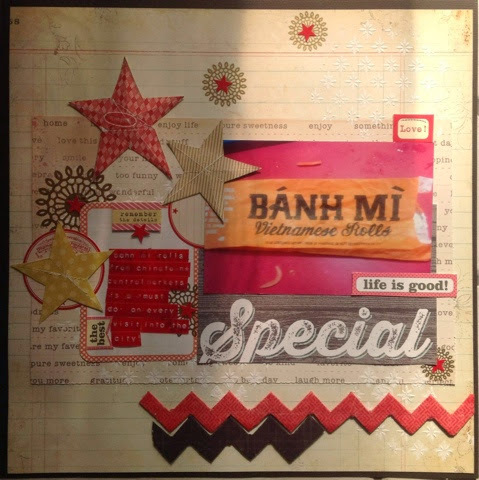 scrappinwithjanet.. : E2c 2014 .. Nat e's class layout..
E2c 2014 .. Nat e's class layout.. This is th layout that was done in the Nat Elphinstone class at Escape2Create in march 2014. Part of it were tricky and had me (and everyone else) sending daggers her way, but the end results were worth it! Mine was based on some thing that makes me happy - a yummy Vietnamese Meat Roll from one of my fav places to get em in Central Markets, Adelaide Chinatown Food Court! They even make them on a wholemeal roll so they are just that little bit more healthy too.